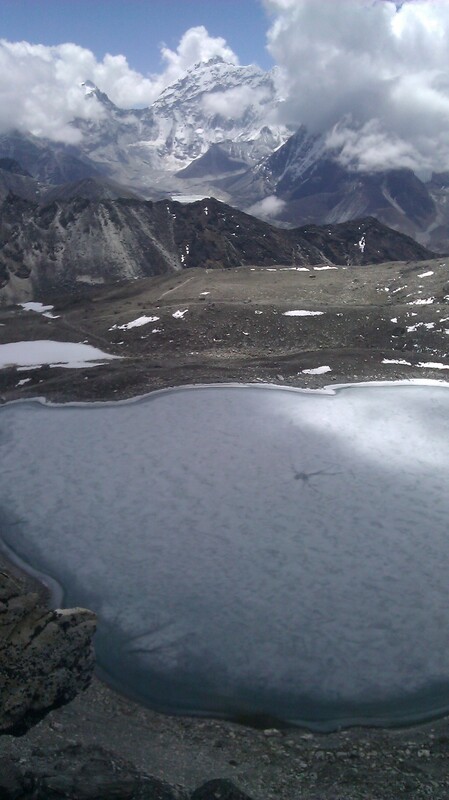 Earlier in the day, at almost precisely 10:30 AM (I keep track of these things when I’m walking), I crossed Kongma La Pass, which, at 5,535 meters (18,155 feet) is the third highest I’ve ever been in my life. 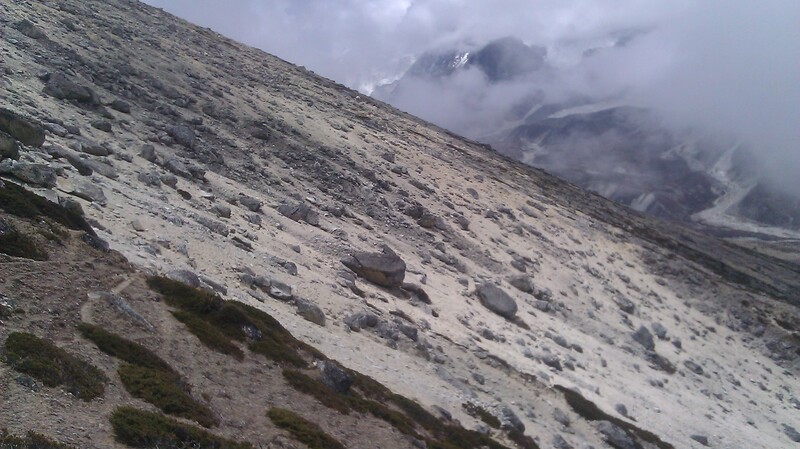 It was also the fifth time I’d ascended and descended up over the 5,300 meter mark in as many days (whether over a pass, up a peak, or up to a particular destination). Needless to say… I was spent. For a bit of extra adventure, while descending, I made the stupid mistake of trying to shortcut the trail, which only resulted in me having to scramble down (and back up) a very steep canyon, cross a large landslide area and cut across ridge-lines to find the main trail (that ended up adding the better part of an extra hour or so to my trek). 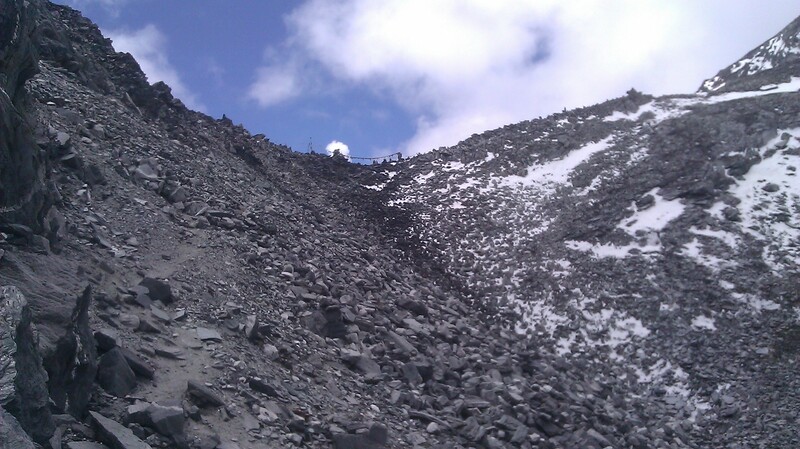 Looking up at Kongma La Pass from the bottom (you can only see a little bit past halfway up from here). By about 1 PM, tired, and a bit frazzled from my shortcuts make for long delays experience, I finally made it down to the river canyon (where I was supposed to be). The wind was howling as it was the afternoon (for some reason, that’s what the wind seems to do in river canyons around here in the afternoon), I had a bit of a headache from the altitude (something I always get while descending for some reason… never while going up) and I was a touch light-headed as well (whether it be from the altitude of just exhaustion). I desperately wanted to sit down and have a rest, but the wind was just whipping across the relatively barren landscape… I had to find some shelter to even hope of having a restful couple of minutes. A bit later, up ahead, I spied a pretty large boulder sitting in a field. It was perfect… I headed over, slumped on down out of the wind and out of the sun (which is also nice because the sun can be intense here, such that, even though you’re freezing, you’ll can get a nasty sunburn as well) and straight away nodded off for a couple of minutes. So there I am. 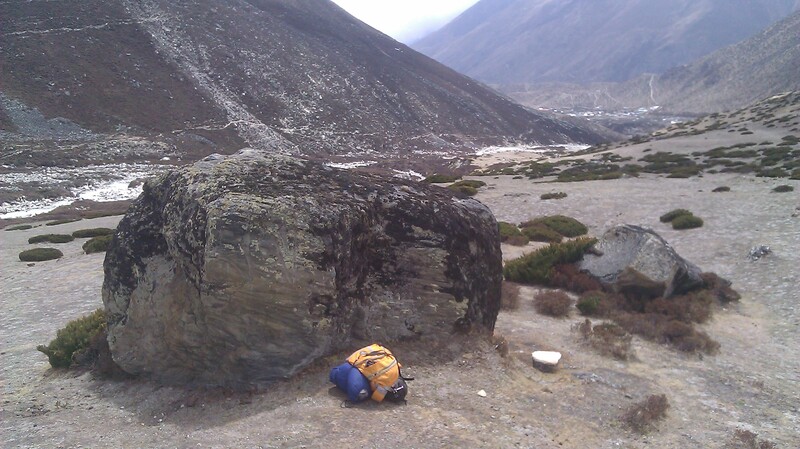 I’m sitting with my back against the boulder, my legs are splayed out in front of me and my pack had been discarded rather haphazardly around me… I probably look just as tired, if nor more so, than I actually am. I come to from my little nap and have some water. 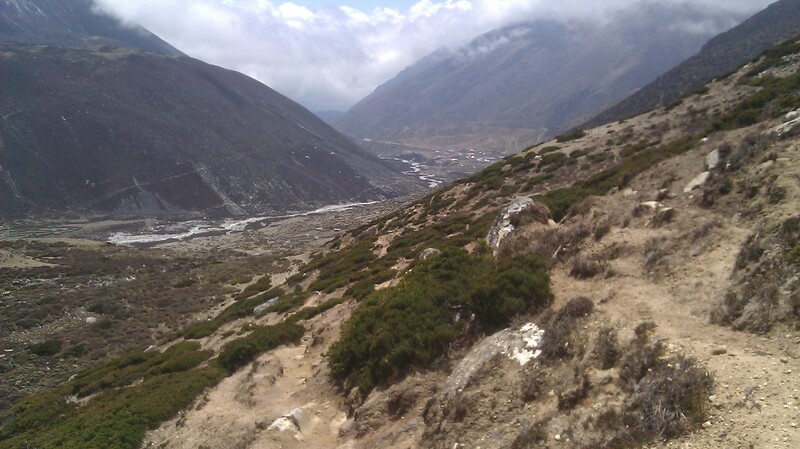 Off in the distance I see a Nepali man heading down the trail my way. He’s actually the first person I’ve seen in a couple of hours, and, although I doubt we’ll speak other than a namaste (Nepali hello) if he sees me, I’m comforted a bit by the sight of another human being. However, this guy notices me and starts heading my way. I’m too tired to move, so I’m still leaning up against the rock when he reaches me. We exchange namaste’s and he asks me if I’m okay… I say I’m fine, just a little tired and thank him for asking. 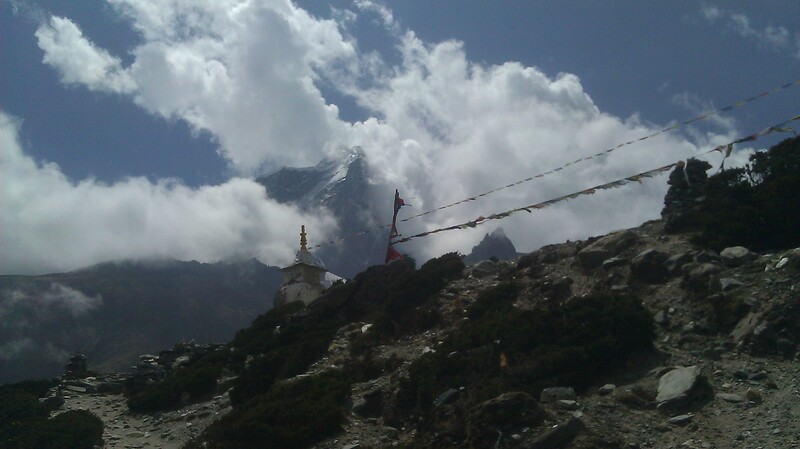 He asks me where I came from, and I say I came over Kongma La Pass from Lobuche (the village where I started out from this morning). He looks down at his watch… it’s 1:15 ish… and then he asks me when I left. I say 8 o’clock, and he begins counting on his fingers… 9, 10, 11, 12, 1… 5 hours he says… you very fast. I laugh and nod and say I guess so. 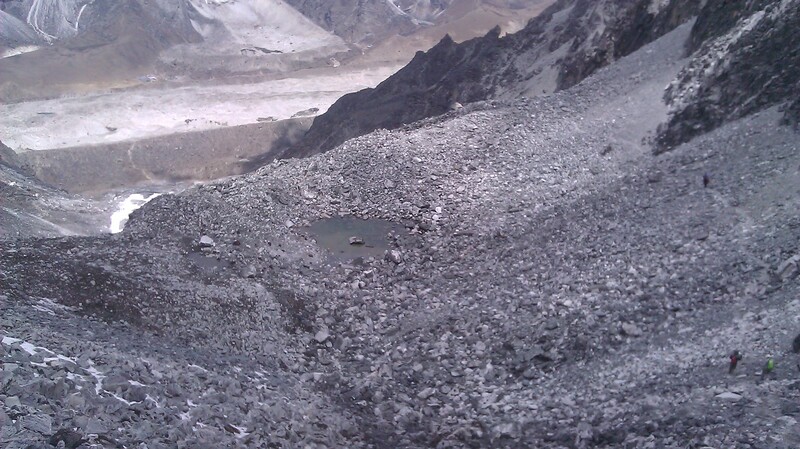 He tells me that the far side of the pass (from Lobuche) is very steep and hard on one’s legs… I laugh again, and nod in agreement telling him that I know now, and that coming from this side looks much, much easier. He laughs and nods his head, and then he asks me if I want some tea… fresh black and ginger tea. My general experience says he’s now trying to sell me something, so I just say no thank you and that I’m all right. But he insists. At first I get the impression that he has to go back up to his house to get it, but then he pulls out a thermos from his backpack, and I figure out that he means that he just brewed it when he left the house 10 minutes ago. He unscrews the cap of the thermos (it’s one of those semi-old-fashioned metal with a a painted hell and plastic top version), which is a cup, fills it with tea and passes it over to me. Well… there’s no turning back now, so I take a sip… it’s delicious and piping hot. I have to drink pretty slowly. He just sits down next to me, and we exchange some small talk (his English is very, very basic, so most of this conversation is in kind of three year old speak) We ask where from? 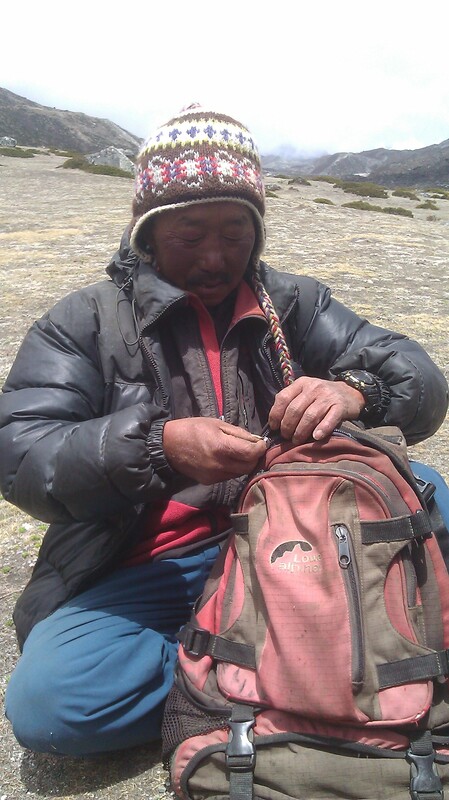 He’s from Dingboche (the next real town down the trail in the direction I’m headed). He’s up at one of these small houses building a wall for the owner and he was on his way home for the afternoon. I tell him I’m from California (I always say California because people seem to always have a good reaction to California… thank you Hollywood). But other than some very basic small talk (we exchange names, he asks where I’m headed, a little about the trek), we’re both mostly silent as I drink the tea. He pours me another cup when I finish the first, and I drink it just as slowly. The wind continues whipping around us, but we’re both sheltered by the rock. I finish my second cup and he offers me a third, but I decline. I thank him profusely as he packs up his thermos. We sit for a few more moments in silence… note that it’s not a bad or uncomfortable silence… just mutual relaxation for a moment after a hard day’s work (his much more than mine I suspect). He then gets up and prepares to leave, I thank him again and ask if I can give him something for the tea. He declines, says nice to meet you and heads on his way… and I continue sitting against my rock for another 10-15 more minutes (although now I have a pretty big smile on face). The tea gets into my blood and bones, revitalizes me, and I get up to head down the trail… smiling right along with the wind and sun. It was just a small moment, but one of those that really puts the world back in perspective. 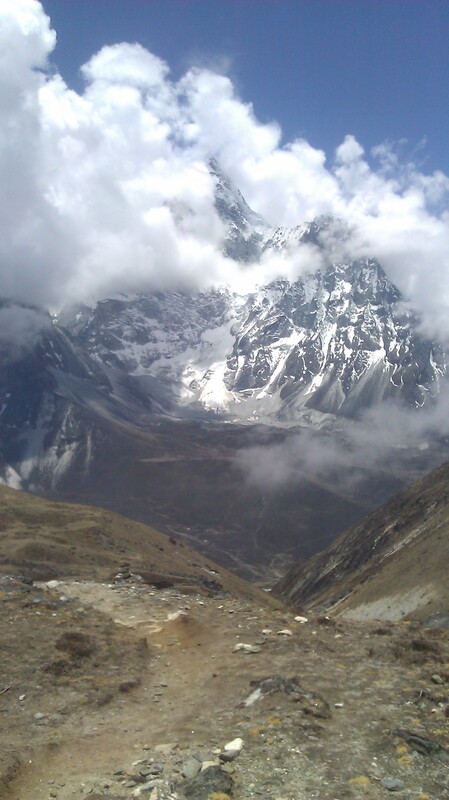 Now, the Everest Base Camp trek is very, very touristy. Not that that’s a bad thing, but it means that, although you’re in Nepal, you rarely get a glimpse into Nepali life. The only Nepalis you really interact with are the lodge owners, guides and porters along the trail (if you have a guide or porter, which we didn’t) or restaurant owners (the exception being the occasional child you see around the villages), and clearly, most of these interactions are commercial in nature… it’s just the way this trek is. So, that context made this moment just that much more special for me… just simple human kindness and interaction without any commercial overtones… I definitely felt an “ahhh… there’s Nepal” feeling that I honestly haven’t gotten much in this country. And human nature being what it is… those are the moments that stick with you… and this was a good one (that I thought I’d share). wow Richard you worry me. What a wonderful real life heart felt story. You are certainly living life to the fullest. Thanks for sharing with us…. Well… you can relax… I’ve done way stupider things than that and lived, so I’ll be alright (also one reason I don’t quite share everything I do in this blog ;-). Thanks for sharing the tea story 🙂 it IS reassuring that sometimes people really do just want to be nice. Wait so what about orange backpack? Is there a stand-in now? 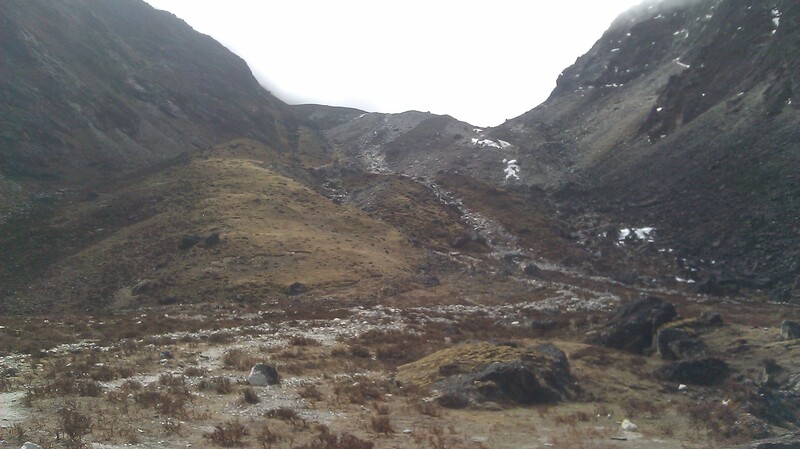 No replacement at the moment… but no trekking in the immediate future, so none needed (for now).